This study is funded primarily by a $3.2 million grant from the National Institute on Aging, a division of the U.S. National Institutes of Health (NIH). There is increasing recognition that Financial Exploitation (FE) of older adults is a significant social problem that deserves the attention of researchers and policy makers. 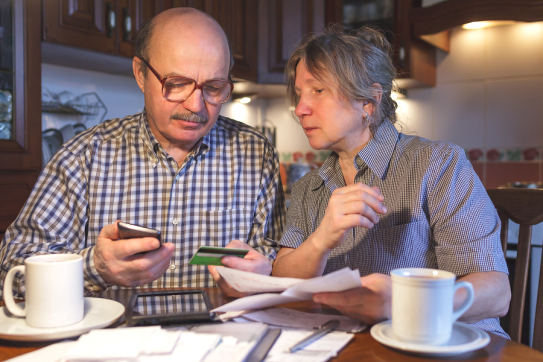 Financial scams/frauds targeting older adults have estimated one year incidences typically between 10% and 15%. With the aging of the baby boomer cohort who hold significant wealth, and their increasing use of the internet and social media, scams and frauds are viewed as an increasing threat to the economic security of older adults. Prior research on this type of FE has examined sociodemographic, behavioral, and psychological variables as risk factors. However, prospective longitudinal studies including detailed measures of both cognitive function and psychosocial factors in ethnically and racially diverse samples is lacking. To examine the impact of psychosocial factors (trust, impulsivity, and depression) on scam susceptibility and FE. We present a conceptual model that describes hypothesized pathways to FE. The study will use a prospective longitudinal panel design to explore FE in diverse community-dwelling populations over a two year period. Telephone screening methods will be used to recruit a sample of 720 White, African-American and Hispanic adults age 60 and older (240 per group) from two sites (U. Pittsburgh; U. Miami). Within each racial/ethnic subgroup, we will recruit 120 age 60-79, and 120 age 80 and older. Three assessments (baseline, 12 mos., 24 mos. ; final n~600; ~200/group with attrition) including a cognitive battery, web-based banking simulation tasks, and web-based scam scenarios will be conducted by trained assessors, along with a standardized battery of self-report measures assessing experience of various types of frauds and scams (FE), sociodemographic factors, social integration/isolation, financial skills/advice and support, psychosocial factors, and financial scam susceptibility. Examination of multiple pathways to FE among the oldest old and in large ethnically diverse samples in a longitudinal design; inclusion of detailed cognitive function, financial skills/advice and support, and psychosocial factors; use of simulations of “real world” financial tasks and scam scenarios; and use of audio computer-assisted self-interviewing (A-CASI) to enhance privacy/reduce potential barriers to reporting FE are innovative. Understanding multiple pathways to FE is important for the development of interventions to heighten awareness and minimize risk. Bookmark this page as we will be sharing the results and analysis of this study as they become available.